February 21, 2008 is the night of a total lunar eclipse, and if you’re planning a big eclipse party, these cupcakes will surely “eclipse” all the other treats. If you’re reading this post-eclipse, not to worry. These cupcakes would be great for any sky-themed or solstice party. And don’t limit yourself to the shape shown. You could do a whole cupcake series featuring the phases of the moon. 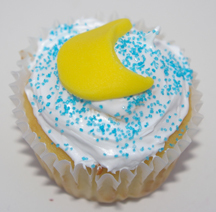 What You Need: 1 cupcake; white frosting; blue sugar sprinkles (or just use blue-tinted or chocolate frosting); yellow fondant, rolling pin; circle-shaped cutter; spatula or other tool to cut moon shape. How to Make It: Frost cupcake and add sprinkles. Roll out yellow fondant. Cut out circle. Then use circle cutter or spatula to cut out part of the moon. If you don’t have fondant, try rolling out a yellow gumdrop or use fruit rolls. This entry was posted on Tuesday, February 19th, 2008 at 4:00 am	and is filed under nature cupcakes. You can follow any responses to this entry through the RSS 2.0 feed. Responses are currently closed, but you can trackback from your own site.